If it's been awhile, here's a little Al to listen to while you read this post. 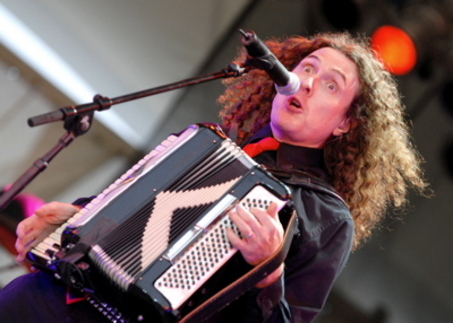 We saw Weird Al perform at our county fair last week. This was my third Al concert, the other two being when I was a teenager (once I saw him open up for the Monkeys!). Whether you appreciate his music or not, there are certain things about Al that are undeniable. He’s consistent - He’s released new work every few years since 1983. I was 13 years old in 1983. This year I was at Al’s concert with my 13 year old son. And we all loved the show! Al seems to be able to wake up the the 13 year old that’s there in all of us. He doesn’t care what people think - Al was nerdy when nerdy wasn’t cool. He is who he is and does not apologize for it. But not in the jerky way. In the cool, humble way. 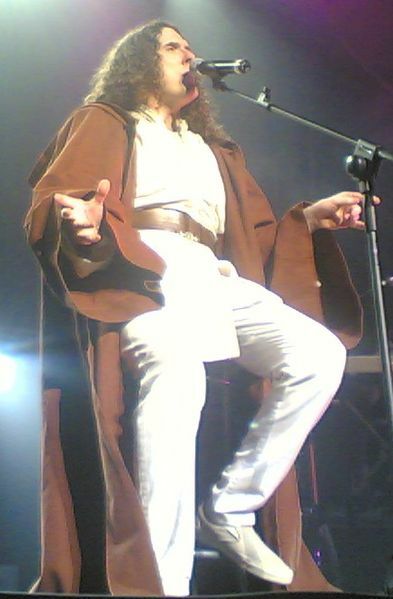 He is generous - It was a hot, central valley evening and he came out and performed for 2 hours with a full costume change for every song. Even though he was at a county fair in Turlock (which, let’s face it, isn’t the big time), there was no sense that he was just calling it in or getting it out of the way. He gave us his weird all. He works hard at what he does - The musicianship is top notch. Al and his band work hard at playing their silly music with skill. There are no short cuts. The music in the parodies are spot on (often with added hand flatulence noises). And there are more than just parodies, Al writes music “in the style of” and original work that is often better than the more famous parodies. Consider “Bob”, a song he wrote in the style of Bob Dylan and every line in the song is a palindrome (every line can also be read the same way backwards). “Lisa Bonet ate no basil.” Genius. He is still having fun - 30 years later, you can feel the friendship between him and his band and there were a few songs they did, less famous songs, that you could tell, they just like to play. They still make each other laugh and there is definitely still joy there in what they do together. 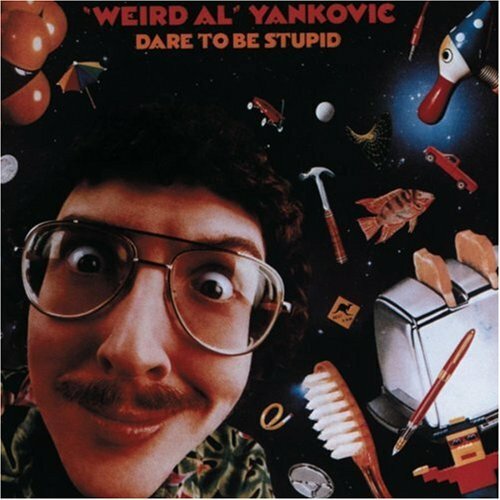 We could all stand to be a little more like Weird Al Yankovic. We met Arley about 9 years ago and, to be honest, I didn’t have much charity for him at the beginning. Aaron was the one that pushed me to get to know him. He was always drunk in the park and the worst kind of drunk at that. He was pitiful. He cried and said he was sorry way too much and I just didn’t think he was worth a lot of our time. I didn’t have patience for him. He seemed beyond hope. I was wrong. 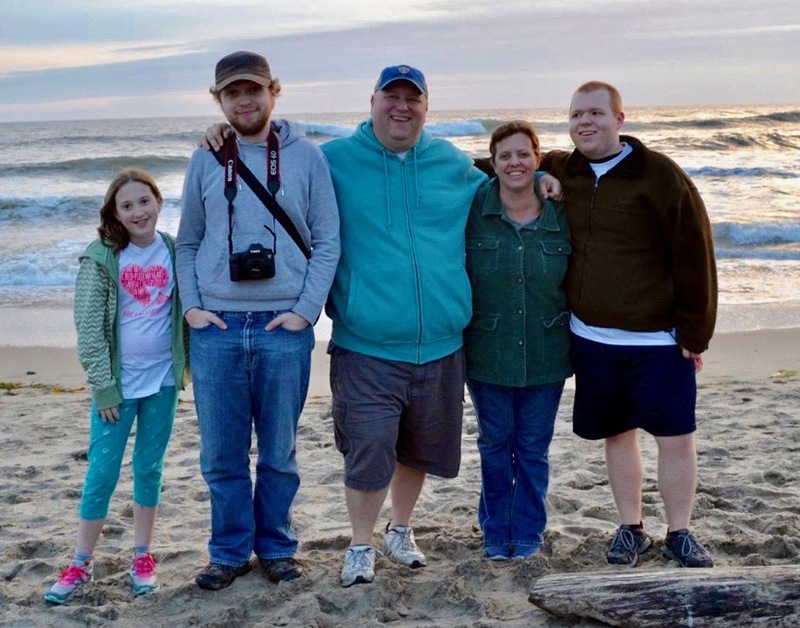 Friendship and consistency and love worked it’s way into Arley’s heart. He opened up to all of it. He opened his heart to Jesus. He sobered up. He began to reach out in love to others and became a real, regular part of our life. He came to 9th Street with us every week. He came to Bible study. We played dominoes, shared lunch and laughed a lot. He was also grouchy, gruff and grumbly. He was doing the best he could with what he was given. He was one of the most resourceful people I have ever known. 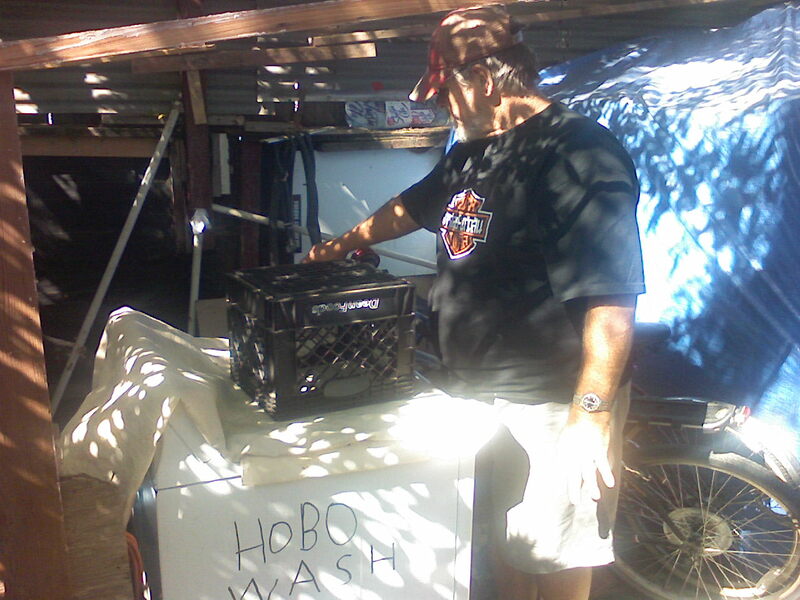 He lived in a little shanty he built in his sister’s backyard called the Hobo Shack. It was every 12 year old boy’s dream and over the years it got some great upgrades. First was the hobo wash machine, then came the hobo fridge and finally, this year, the hobo AC! 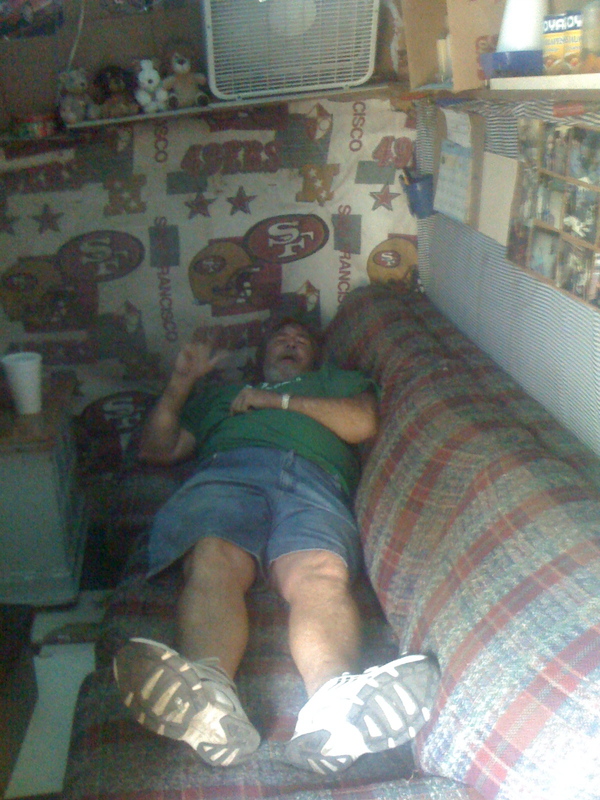 He had a TV, DVD player, stereo (always playing country) and pictures of his friends on the wall. This past Superbowl Sunday, he called right as the game was starting to ask for a ride to the hospital. I knew it was bad. Arley hated doctors and didn’t like to be fused over in any way. He was in for 10 days. They discovered multiple inoperable blood clots in his abdomen. The only thing they could do was try to keep his blood thin enough to travel around them and hopefully they would absorb back into his body. Since that time in the hospital, Arley had just not been his same self. He never quite felt up to anything. Arley passed away two weeks ago and it’s just still so hard to wrap my mind around. 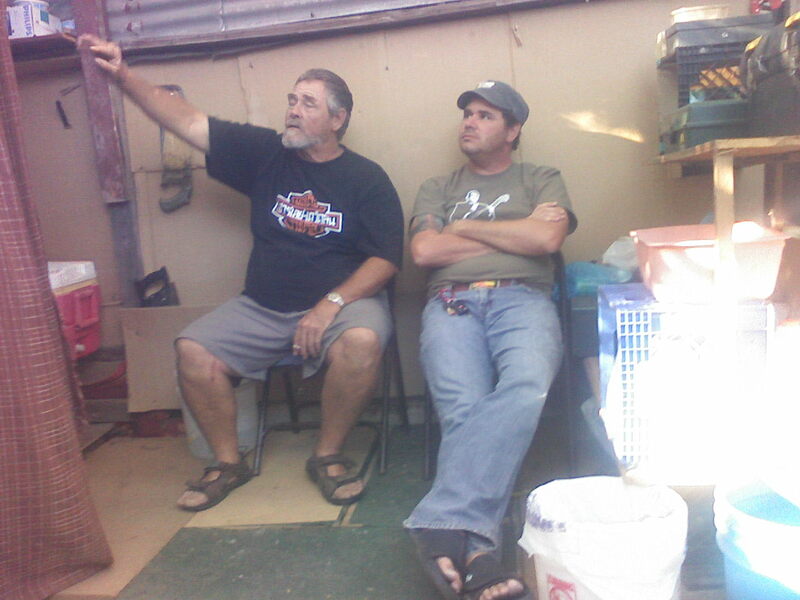 He was my good friend and I really miss him. He really has left a big hole in my life. We had taken Arley to lunch countless times. 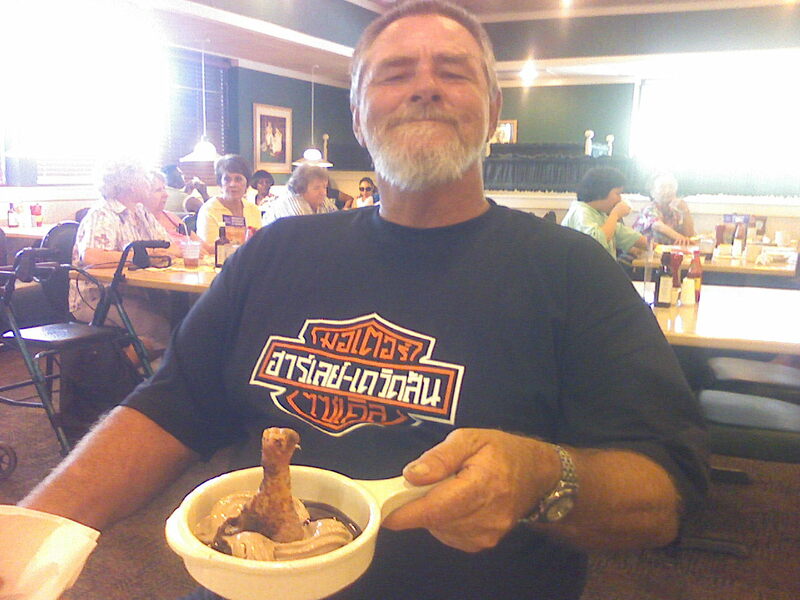 Especially memorable were the annual birthday trips in May to Hometown Buffet, his favorite place. He loved to surprise us with the weird combinations he’d bring back to the table. Aaron and I got to spend a last day with Arley a few weeks ago. He had come into a little money and wanted to take us out to Hometown, his treat! He also had us back to the Hobo Shack for a movie. It was about as perfect a last day as we could have hoped for. And to think, I almost passed it up to “get some stuff done”! In Genesis, it says that Abraham died happy and at a ripe, old age. And that is, I’m sure, all of our wish. But it doesn’t always happen that way. So many in my life have died way too young. Arley was only 61. But I do know this, sometime on July 3rd this year, Arley died into happiness. The weight he struggled with from his past life rolled off his shoulders and he stood up in Light and now knows even as he is known. No more dim glass for him. Now, he sees face to face. But here, we live with the vacuum that he leaves behind. I had lunch with Arley almost every Friday for 7 years. We can feel his absence at the 9th Street Cafe. His domino table sits empty. There is no stopping at Madera Ave to pick him up. There is no happy dread of what is going to come out of his mouth when he gets in the van. He’s just gone. At some point, Jimmy read that one of the origin stories of the word “Hobo” is that it came from the words “homeward bound.” So, Arley is no longer a Hobo. We are the hobos. We’re on our way to the happiness he’s found. And I can’t wait to share it with him. "Remember when you used to update the blog?" Joshua said this to me yesterday and it got me curious. So I checked my blog homepage this morning and found that I hadn't posted to our site since May! I used to be all about the blog. I love blogs. I read a lot of them. Especially ones that my friends write. But it seems these kinds of posts are fading away in the quick-i-ness of Facebook , Twitter, Vine, Instagram and the like (Linkedin? Anyone? Hello? echo, echo, echo...). And you can find me on all of them. 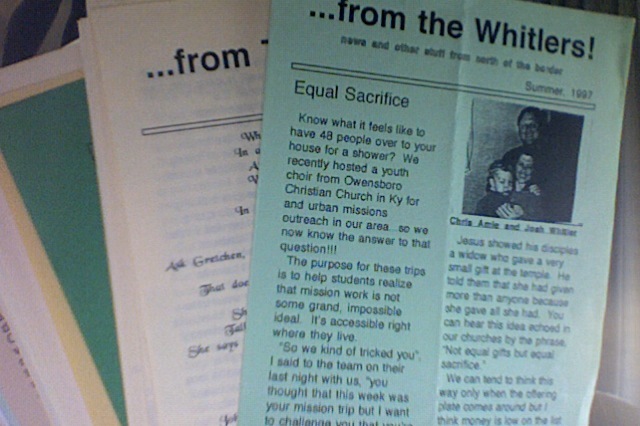 I also took a little time this morning to look back through our old newsletters we used to mail out. Newsletters! That went out in the actual mail! My friend Aaron used to make fun of our ever so creative title, "From the Whitlers". I thought it stated exactly what needed to be said, "This is from us, yes us, the Whitlers". Whatever the form, I've always wanted my communication to be more than information on what we do and what we need. My desire is to give real encouragement to my friends through honest reflection, story telling and creativity. Really, this is the goal of my life, on and offline, over coffee or a meal, in the car, walking or working, writing, posting, singing and preaching. I want to always be reflecting on how we are blessed and seek ways to be a blessing. What more is there? I got some bad news...I'm really bad at following through with stuff like this. My brother in law challenged me to keep a web journal about how things are going in my life and work for my friends and supporters. So here I am (feeling a little sick today) on a hot Wednesday afternoon begining on this thing that I hope I can see through. I have to...cause I have felt the challenge from Kevin and Aaron. Cause I have also felt the challenge from God and my own heart. And last but not least, in the midst of my argueing with myself about if I have enough time to invest in a web journal, I bought a bottle of Jones Soda a few days ago and in the bottle cap it read, "Start Your Journal." There's no argueing with that. So here it is. Enjoy." And there is it folks, right there in my first post ever, a statement about how I may not be able to keep a blog going. And, whether it's important or not, I got a little itch to start posting here and other places a bit more. So, just like back in August of '04, we'll see.